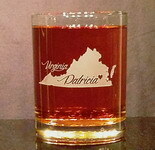 These 13oz home state of glasses are personalized with the name of your choice and a heart located on your hometown. The state itself is what is sandblasted out of the glass, leaving the names and heart to stand out. 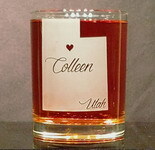 This whiskey glass makes a lovely gift for graduation, housewarmings,or weddings! We can use these state designs on any of our glasses. We can also use a version of the state with just the outline sandblasted out of the glass, or use initials, or any combination you like. 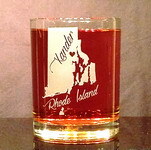 We carry all 50 states, and can use this design on any glass. We can also use any country.